Scoop the ice-cream into the bowl of a stand mixer and beat on low speed for 1 minute or until softened. Spoon the ice-cream into 6 x ⅓-cup-capacity (80ml) popsicle moulds. Insert popsicle sticks and freeze for 8 hours or overnight. Remove the ice-creams from their moulds and place on a baking tray lined with non-stick baking paper. Place in the freezer until ready to use. Place the chocolate and oil in a small bowl and mix to combine. Set aside. Place the water, cream of tartar and ½ cup (110g) of the sugar in a small saucepan over high heat. Cook, stirring, until the sugar has dissolved. Bring to the boil, reduce heat to medium and cook for 4 minutes. Place the eggwhites in the bowl of a stand mixer and whisk on high speed until stiff peaks form. While the motor is running, add the remaining sugar, 1 tablespoon at a time, whisking until thick and glossy. Gradually add the hot sugar syrup in a thin, steady stream and whisk for 4 minutes or until glossy and cool. 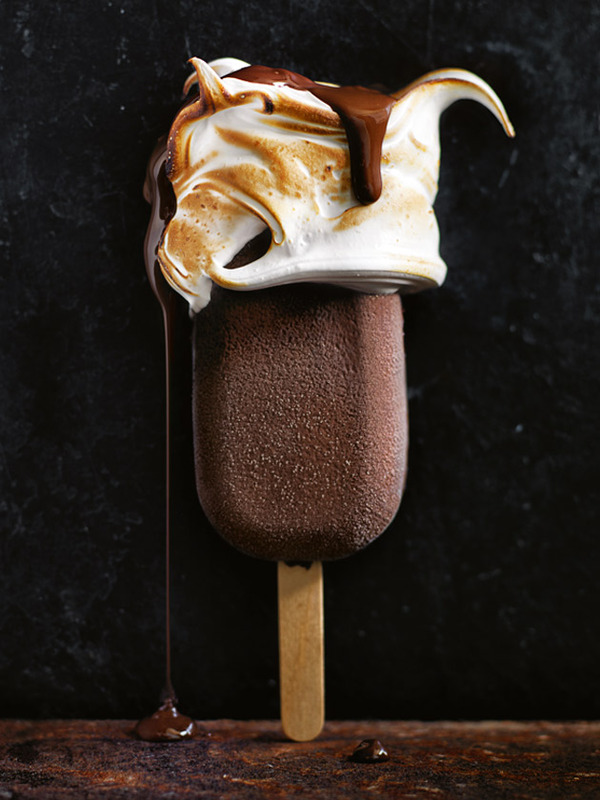 Using a palette knife, spoon the meringue onto the top of each popsicle. Using a kitchen blowtorch, lightly torch the meringue until golden brown. Spoon over the chocolate sauce and serve immediately. Makes 6.